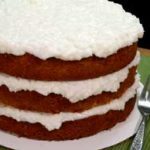 Super moist coconut cake that takes 5 days to complete, but so worth the wait. Place the thawed coconut in a large mixing bowl. Mix everything together until fully combined. Cover the bowl. Refrigerate overnight. Next day: Prepare cake layers according to package directions. Let cake layers completely cool before assembling the cake. When ready, remove frosting from refrigerator and stir well once again. Assemble your cake, adding frosting between layers and on top, but not on sides. Place assembled cake in a covered cake plate that is air tight. Refrigerate the cake for four days before serving. Recipe is adapted from a WRAL TV recipe submitted by Elizabeth Gardner. Make your own layers from scratch, or use a white or yellow cake mix.